The setting is war-torn England, 1939. 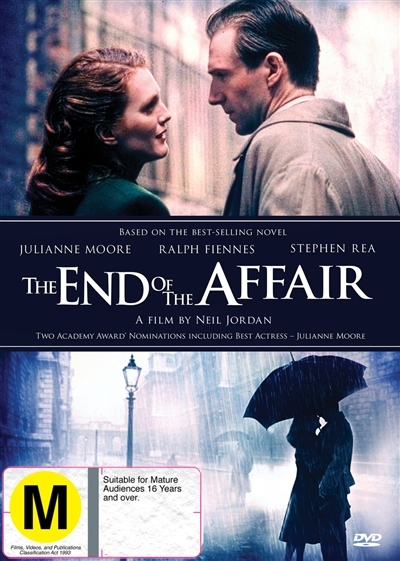 Sarah Miles (Julianne Moore) is married to Henry (Stephen Rea), a man she loves but with whom she shares no intimacy. When she meets Maurice Bendrix (Ralph Fiennes), the two have an immediate attraction to each other and embark on a torrid a... read full description below. The setting is war-torn England, 1939. Sarah Miles (Julianne Moore) is married to Henry (Stephen Rea), a man she loves but with whom she shares no intimacy. When she meets Maurice Bendrix (Ralph Fiennes), the two have an immediate attraction to each other and embark on a torrid affair. Their passion is as earth-shattering as the bombs that explode around them, until the day Sarah mysteriously and abruptly walks out of Maurice's life. Two years later, Maurice runs into Henry, who confides his suspicions of Sarah's infidelity. Fueled by his own jealousy and desperate to solve the mystery surrounding the end of their own romance, Maurice agrees to help. His investigation not only re-ignites his love for Sarah but also leads him to discover a devastating secret which will change their lives forever.